It won't do you any good to carefully source gluten-free hot dogs if the mustard you're putting on your dog isn't safe. Fortunately, decent gluten-free mustard choices abound for those of us following the gluten-free diet. 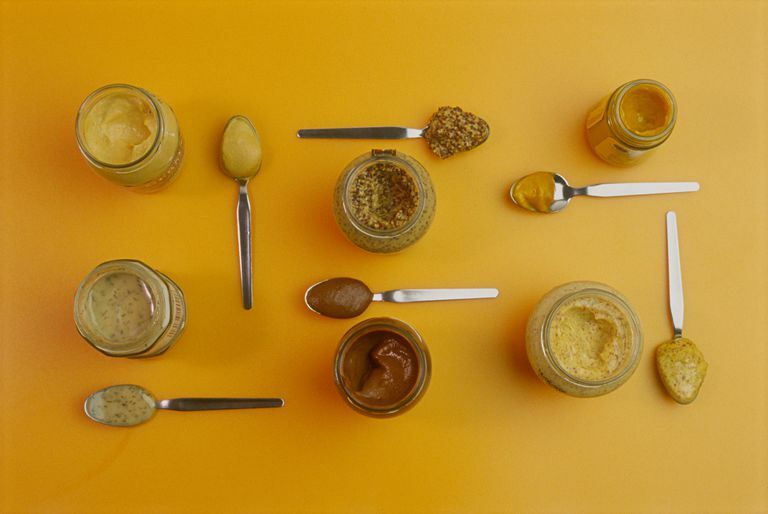 They range from basic yellow mustard to more exotic varieties such as honey mustard and dijon mustard. Popular mustard brands in the U.S. are gluten-free. This includes mustard from French's, Heinz, and Koop's Mustard. In addition, organic and gourmet brands such as Annie's Naturals, Boar's Head, and Organicville also offer gluten-free mustard. Annie's Naturals. Annie's Organic Honey Mustard, Organic Yellow Mustard, Organic Dijon Mustard, Organic Horseradish Mustard and Lite Honey Mustard Vinaigrette (a salad dressing and marinade) all are considered gluten-free to below 20 parts per million of gluten. Annie's uses distilled white vinegar that's derived from corn or beets, not wheat, according to a customer service representative. Boar's Head. This brand, best known for its high-end gluten-free cold cuts, also offers a range of mustards, including: Delicatessen-Style Mustard, Honey Mustard, and Reduced-Sodium Yellow Mustard. All are gluten-free to less than 20 parts per million, according to the company. French's. French's, one of the more popular brands of mustard in the U.S., says that all of its prepared mustards are gluten-free to less than 20 parts per million except for its Tangy Sweet & Smooth BBQ Mustard, which contains gluten. "Because product formulations may be modified occasionally, we recommend that persons on special diets always read ingredient statements carefully even on products which previously have been found acceptable," the company says in its gluten-free statement. French's states that the vinegar in its mustards and other condiments is ethyl alcohol, another term for grain-derived alcohol or ethanol, so that means the alcohol can be derived from wheat. Grey Poupon. This upscale mustard is produced by a subsidiary of Kraft Foods, which will disclose all gluten-containing ingredients on food labels. Grey Poupon doesn't contain any gluten ingredients. That being said, Grey Poupon also isn't labeled gluten-free so it may, in fact, be subject to gluten cross-contamination during manufacturing. Gulden's. Gulden's, a subsidiary of ConAgra Foods, makes Spicy Brown Mustard, Yellow Squeeze Mustard, and Zesty Honey Mustard. Like Kraft, ConAgra maintains a policy of divulging gluten ingredients on its product labels. Gulden's mustards don't contain gluten ingredients but aren't labeled gluten-free, so they may be subject to gluten cross-contamination. Vinegar in Gulden's products can be derived from corn or wheat, according to the company. Heinz. In the U.S. and the U.K., all varieties of Heinz mustard are considered gluten-free to 20 ppm, according to the company's gluten-free product list. In Canada, only Heinz Yellow Mustard is considered gluten-free. Heinz reports that it uses corn, not wheat, as the source for its vinegar. Koops' Mustard. Koops' makes eight different flavors of mustard, including Horseradish, Honey Mustard and a flavor called Arizona Heat (which includes red and green peppers). The company labels its products gluten-free. Organicville. Organicville makes organic Stone Ground Mustard, Yellow Mustard, and Dijon Mustard. The company is gluten-free certified by the Gluten-Free Certification Organization, which requires testing to below 10 parts per million of gluten. Company founder Rachel Kruse reports that Organicville uses vinegar that's also certified organic to make its mustards, and the vinegar is derived from either corn or cane, not wheat. As you can see, you have plenty of options even if you're particularly sensitive to trace gluten—there's at least one family of mustards on the market that are certified gluten-free, meaning that manufacturer has in place stricter protocols about preventing gluten cross-contamination. It's worth noting that some people with celiac disease and non-celiac gluten sensitivity react to vinegar that's been distilled from gluten grains (in this case, usually wheat). Keep in mind that companies are not required to divulge the source of vinegar in condiments, even if that source is wheat (one of the top eight allergens). If there is available information on the source of vinegar in these mustards, it's listed above. Once you've found a mustard (or maybe several) you like, you're all set to make the perfect frankfurter—don't forget the gluten-free hot dog buns.